In the unfortunate event that flooding occurs near you, be sure to obey these five safety rules. Failure to do so may be putting yourself or your loved ones at risk. You want to be sure to consider the consequences of your actions during the event very carefully, and it's important to avoid panicking. Use a battery-operated radio to listen to the local news and weather reports, and make sure you have extra batteries handy. This is your source of information about what is going on outside your home or business. Listen carefully for instructions about whether and when you need to leave the area. If you are caught outside during a flood, don't try to wade through the rushing waters. The current may be swifter than you realize, and you can easily be knocked down in and swept away in only a few inches of water. Instead, move toward higher ground as quickly and carefully as you can. A portion of the road that has been flooded out is a danger area and should be avoided. Even if you see other drivers attempting to drive through, think safety first and turn around and drive in the other direction. There is no way to determine how deep a flooded area is or to anticipate whether your vehicle will be able to get through it safely. Even a relatively shallow water level (24 inches or less) can cause a vehicle to be swept away in the flood waters. If a vehicle becomes disabled in a flood, get out right away. Don't stop to try to move it; doing so wastes valuable time that is better spent getting away from the danger zone. The car doesn't provide a safe haven at all. If it starts to float away in the water, it will likely be pushed to the side and there is a real danger of it being flipped over by the rushing water. Once that happens, anyone who happens to be inside will be trapped and runs the risk of drowning or succumbing to hypothermia from exposure to frigid water. 5. Evacuate a flooded area immediately if instructed to do so. In a situation where you are given instructions to leave a specific area by authorities, follow the instructions carefully. You may be told to take a certain route to safety. Choosing to follow a different one may mean that you end up on a road that is blocked or otherwise unsafe. Keep your radio on so that you will know if the instructions have been updated or certain roads have been closed down entirely. Be sure to buckle up and drive carefully when leaving the flooded area. 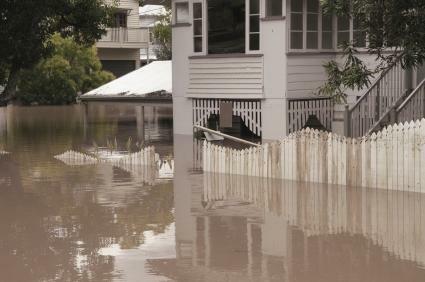 The five safety rules you should practice during a flood listed here are meant to help you stay safe during this type of natural disaster. Your first priority should always be getting yourself and your loved ones to a safe location, away from the flooded area. While it may be tempting to try to rescue cherished possessions before fleeing, this would be a mistake. You can always replace "stuff," but a life can never be recovered after the flood waters subside.